WESTFORD, Mass. – (April 11, 2019) – Johnson Controls has updated its popular Illustra Pro camera family with the Illustra Pro Mini-Dome, featuring new Smart Wide Dynamic Range that optimizes video quality while minimizing configuration time. Available in a complete range of image resolutions and lens options, the Pro Mini-Dome is ideal for a wide variety of deployments in both medium and large-sized facilities. Smart Wide Dynamic Range available in the Pro Gen3 Mini-Dome reduces configuration time while greatly improving the quality of the video stream in varying lighting environments. By effectively reading the scene, the Mini-Dome can adjust contrasting and overall scene balance without operator intervention. Setup times are also reduced with the addition of configuration profiles, such as retail, gaming and indoor/outdoor scenes, where camera settings are automatically adjusted based on the environment, with a simple click of a button. The Pro Gen3 Mini-Dome also automatically adjusts settings to the desired mount for ceiling or wall for additional labor savings. "he smart technology embedded in our latest generation of Illustra Pro cameras automates picture tuning and ensures that what you see is always dynamically optimized even in changing scenes and lighting conditions. We are aiming to reduce operator setup and management costs while always delivering a perfectly configured picture," said Ric Wilton, director of product management for Illustra. "Adding intelligent, automated capabilities to our solutions is core to our product design and the illustra portfolio." Building off the previous generation of cameras, the Mini-Dome improves on important features such as Wide Dynamic Range, Illustra® IntelliZip bandwidth management, effective failover redundancy, cybersecurity and Video Intelligence Analytics. Mini-Domes are available in three and eight MP options as well in Wide Field of View and Narrow Field of View options, and are not impeded by physical barriers such as a bubble housing. Users can offload analytic streaming from network video recorders to the edge on Illustra cameras, saving time and resources. This feature, Video Intelligence Analytics, provides real-time, user-customizable event alarms that allow for quick reaction to incidents. By gathering transformative data instantly, users can better allocate human resources elsewhere. 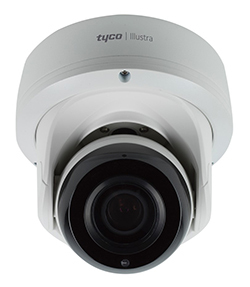 As part of the Tyco Cyber Protection Product Security Program, the new generation of Illustra Pro cameras will also have enhanced safeguards against cyber attacks. With cyber-threat resilience in mind, the solution includes “secure boot” which prompts the installer to change passwords upon installation. Additional safeguard controls include an enhanced security mode which forces the use of complex, non-default passwords and encrypted communications. The Pro Gen3 Mini-Dome will be available to order in May. For more information, please visit http://www.johnsoncontrols.com.